Thallus: immersed, only a small part superficial, extensive, continuous, thin (100-150 µm); usually without dark prothalline line surface: +smooth, pale gray goniocysts: absent soralia: very numerous, brown to dark gray or indigo, or yellow-gray to blue-gray or brown, or eroding and creamy white, sometimes erumpent, mostly discrete, parallel to the grain of the wood, +round to narrowly elliptical (or +lobed), 0.2-1 x 0.2-0.4(-0.8) mm, +flat, somewhat constricted at the base soredia: farinose, 19-30 µm in diam., with brown pigment which is unchanged in K, inspersed; photobiont: algal cells few except in the soralia, 8-10 µm in diam. Apothecia: absent to very numerous, constricted at the base, +round or deformed (to short ellipsoid or lirelliform), with rounded ends, straight or +c- or s-shaped, sometimes several confluent, 0.2-1 x 0.15-0.4 mm disc: pale brown to red-brown or dark brown, brownish black when wet, +plane (to concave), epruinose margin: narrow, dark brown, epruinose, forming +erect and somewhat raised 'lips' exciple: reddish brown, at the base and laterally 15-20 µm thick epihymenium: pale brown, granular, 15-20 µm thick hymenium: pale yellow, not inspersed, I+ deep blue, c. 60 µm high; paraphyses: filiform, simple, little-conglutinate, with clavate tips; hypothecium: hyaline, 60 µm thick asci: clavate, thin-walled, 50-55 x 10-12 µm, 8-spored, with +obliquely uniseriate spores ascospores: hyaline or a few old spores becoming gray-brown, simple, ellipsoid to ovoid, 8-12(-16.5) x (3-)4-6(-7.5) µm Pycnidia: usually present, inconspicuous; wall: gray-brown conidia: filiform, curved, 15-20 µm long Spot tests: thallus K-, C-, KC-, P-; soralia usually K+ citron yellow to orange, P+ orange Secondary metabolites: stictic acid, usually with other members of the complex, including norstictic acid; atranorin has also been reported; there may be several chemical races (see Brodo 1976, p. 403). Substrate and ecology: on conifer wood and stumps, including driftwood, in maritime to high montane sites, mostly on decaying trunks near the ground in humid situations; in Douglas fir, pine-fir, and spruce-fir forests World distribution: Holarctic in the Northern Hemisphere, centered in the boreal zone and the oroboreal belt in Europe and North America Sonoran distribution: eastern Arizona at 2830-2990 m and southern California at 400 m. Notes: Xylographa vitiligo is distinguished from other species of the genus, with which it is frequently intermixed, by its soralia, which are generally larger, more discrete, and paler than patches of goniocysts, and react K+ yellow to orange, P+ orange. 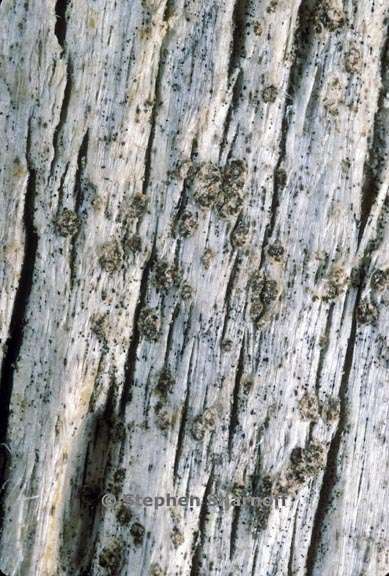 While the apothecia and soralia are usually short and ±round and irregularly oriented, with superficial, dark farinose soredia and pale discs, in some material from our region the apothecia are somewhat darker and more elongated (resembling those of X. parallela). When sterile X. vitiligo may be confused with various sorediate species in other genera, from which it may be distinguished by the reactions of the soralia, which contain stictic or norstictic acids. Xylographa vitiligo as delimited here is rather variable, and may consist of more than one taxon.